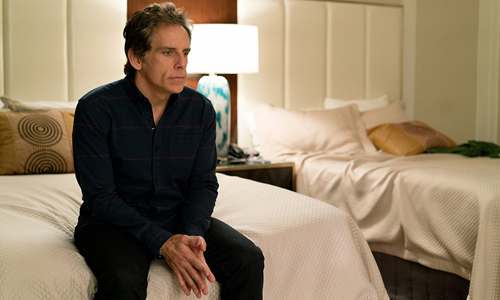 It takes a little over an hour, but somebody finally gets real with Brad (Ben Stiller) after he sulks and increases his anxiety throughout Brad's Status. A trim, attractive guy pushing his 50s and married to a government-employed wife (Pam from The Office, no less! ), who owns a small but nice home and continues to keep a nonprofit business afloat, suddenly begins his version of a midlife existential crisis after comparing his successes -- and relative failures -- to those of his college buddies. They include an wealthy hedge-fund manager (Like Wilson), a Hollywood director (Mike White), a televised political commentator (Michael Sheen), and an entrepreneur (Jemaine Clement) who sold his business and retired to Hawaii, so … in comparison? Sure, Brad's not on the same level. 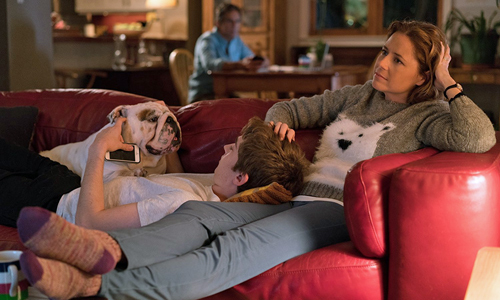 But as his wife (Jenna Fischer) notes, his friends comprise "the top 1%", and that's what becomes so maddening about writer/director Mike White's character drama. He's grasped at society's legitimate problem with comparing a person's life to the affluence of others, then transformed it into a depiction of ingratitude and privilege that makes one actively dislike what's otherwise a sincere performance from Ben Stiller. Despite being a generally pleasantly-mannered individual, Brad has a problem with self-absorption, harboring a narrow focus around him that's surprising considering that he not only owns a nonprofit business, but actively works with other nonprofit businesses as part of his dealings on a regular basis. His languishing over wealth and general success decided to come up at an inopportune time, just before he's set to take his son, Troy (Austin Abrams), on a trip up to the northwest to check out colleges. A combination of necessity and curiosity leads to Brad calling one of the old buddies from his school years -- Craig, the political commentator -- for a favor and to have dinner, bringing those concerns about his "status" to the forefront. The film charts Troy's experiences in interviewing at school around the Massachusetts area, while Brad resolves his feelings about the fact that he doesn't have the advantages and luxuries of his contemporaries, making him question his satisfaction with his life and his actual purpose. Mike White does his best to make Brad's Status unique and accessible through an intimate, suffocating cinematic style heavy on the close-ups, operating on subtle movements of the camera that captures Brad's tweaked and frustrated mental state with each new thought that enters his head. Much of the film operates on his almost monologue-like narration that functions as the character's disgruntled stream of consciousness, tracking his insecurities and cynical deductions as he dwells on the lavish lifestyles -- both factual and embellished -- of his friends. You can't really trust those images in his mind, though, because there's no real-world frame of reference to what his friends are really like, beyond catching a glimpse of Craig on a TV screen and the Hollywood director on the cover of a magazine. That plays into the idea of how people learn details about well-off individuals and try to create an image of what their more satisfying day-to-days are like by filling in the gaps, which all reflects upon sincere elements of certain people's psyches as they get older and view others enjoying the spoils of success. What's troublesome about Brad's Status isn't the concept, or the intentions of its message, but the individual that Mike White decides to place in such a position of insecurity. Perhaps he sees Brad as someone who's in the middle of the spectrum of success, yet Brad's far closer to the upper-end in terms of how his life has played out. He may have less money and influence than that of hedge-fund managers or tech-biz early retirees, but he still made it to where he's at by following his passions, sticking to his virtues, and going through life with a spouse who's alright with all that … and a huge chunk of Brad's Status focuses on how he looks upon those facts with disdain and regret because it doesn't measure up to the ultra-wealthy. Ben Stiller routinely and credibly plays characters with likable and unlikable traits, but the intensity of Brad's selfish and discontented focus upon himself outweigh the few positive merits displayed in his dedication as a father, even clouding his efforts to pull strings for his son as ways of convincing himself that he, too, has some form of influence and inner privileged connections. Brad's Status enters this premise with reasonably clear, predictable objectives: for the titular character to build perspective on what he's gained through his profession and family, and more deeply appreciate those things upon further reflection and exposure to the realities of his friends' lives. Alongside Brad's pessimistic viewpoint that he -- and, by extension, his son and those hoping to get involved in noble matters -- should've concentrated on "selling out" by making a lot of money and then doing more rewarding deeds later, his grateful perception of his own life only takes shape after the undesirable aspects plaguing his friends' situations come to light, thus weakening the film's message. Not even after a younger character emphasizes Brad's positive standing in the grand scheme of society -- drawing his attention to global poverty and the errors of his "competitive" mindset -- does he fully realize the value of what he has, not until more comparisons are drawn that showcase how his friends cope with health issues, vices, and corruption. Brad's glad to not share their status instead of appreciating his own. To be fair, the marketing material surrounding Brad's Status doesn't try to hide that it's about this middle-ish class guy comparing himself and his otherwise rewarding profession to upper-upper class contemporaries and their "status". The hope, however, was that writer/director Mike White could be able to transcend those limitations with his depiction and speak to a wider audience, perhaps reaching out to disheartened Millennials, Gen-Xers and others on the outskirts of those brackets who might feel compelled to judge the quality of their existence to their peers (or older). Despite White's efforts to legitimize the experience and elevate it with mildly absurdist depictions of those in the 1%, that isn't allowed to happen unless those watching view Brad as a negative role model from start to finish, as teary-eyed moments of redemption and catharsis are soured by his prior inability to purely appreciate what he's created for himself. Like the main character's quasi-monologue narration, Brad's Status stays too self-focused on his specific experiences to genuinely express what's to be taken away from them.